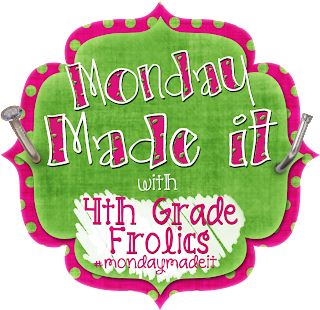 I am joining up with 4th Grade Frolics for her Monday Made it linky. I can't believe I have never linked up before- but I am a slow crafter. I can't have too many projects going because it drives my husband crazy (I never finish them)! Have you seen these boards on pinterest? It is from Second Grade Style I have seen some other boards like this on pinterest but I can only find this example right now. I wish that I had made this last year with my second graders. It would have been so helpful to keep track of the many places they went! I want to try this with my kinders for this year. I think it may be difficult in the beginning but I have some ideas to make it more "kinder-friendly." First, I used these wooden circles I bought at hobby lobby as the base of the magnet. I wanted to spray paint them purple. I didn't realize how difficult spray painting something could be when you live in an apartment! It was way too windy to spray paint them on the sidewalk (my original plan) so I built a plastic bag cave and spray painted them in my kitchen! Thank goodness I didn't get any spray paint on the sink or counters :) The force of the spray paint blew the wooden circles around but I only needed one coat on each side. Ta-daa! 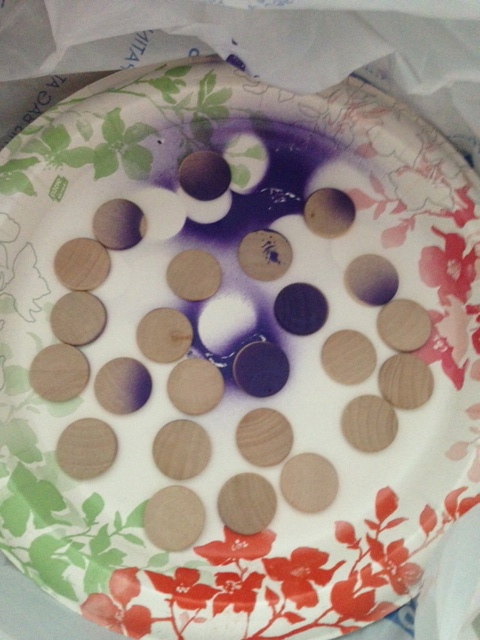 The materials are laid out and ready to go- cookie sheet, spray painted circles, and adhesive magnets. These magnets were so easy to stick on! I hope they last the year. 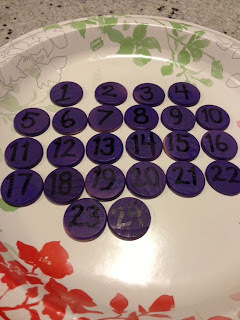 I painted a number on each of the magnets using a paint pen. I wish I would have used white paint- it would have stood out more on the dark purple. I am also not sure that kinders will grasp on to the whole numbering concept. It will take a lot of teaching because most of my supplies are numbered. I am thinking of putting their picture over the numbers initially to help them use the board and then as they get more comfortable with the numbers removing their pictures. I used small duct tape to divide the board- it is a little crooked, I may have to fix that! And here is where the project sits for now- not done! The where are you going label will go above the magnetic board. 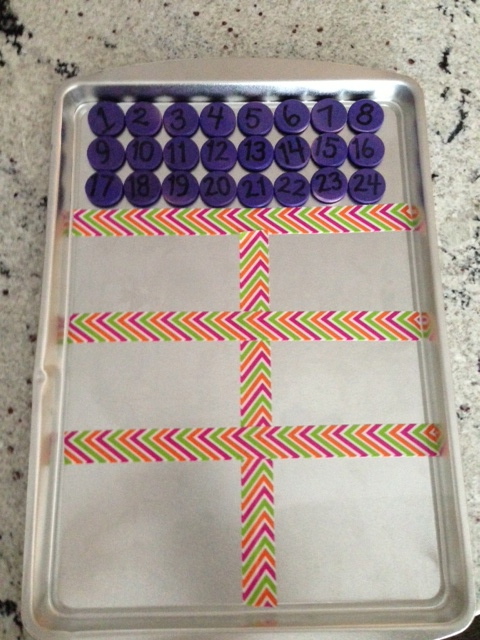 I am going to glue the number chart to the board so that students know where their magnet's "home" is located. The labels will also be glued to the board. 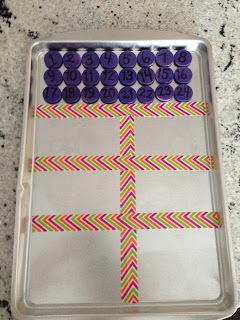 In the examples I saw on pinterest most of the sections were only labeled and I know that kinders would struggle with putting their magnet in the right spot and then what would be the point of this whole thing! LOL. I made the labels with clip art so that they can hopefully put their number in the right spot when they leave the room. Once my new laminator comes in the mail I am going to laminate all of this and finish it up! I can't wait! You might want to make a magnetic board like me or you could just print off the labels and put them in name tag protectors for hall passes. Use them as you wish! Enjoy! Great idea for the magnet board. I made one today and am getting so many different ideas of what to do with it from Monday Made It!